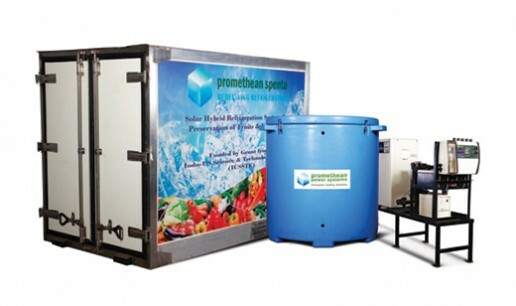 Promethean’s Cold Storage Solutions (CSS) is the most economical way to chill, store and transport fresh fruits, vegetables and other perishables. Chilling the fresh produce immediately at the source is the most optimal solution to India’s cold-storage challenge. This stationary cooling system can chill farm produce under erratic grid conditions without requiring a diesel generator. At the heart of the CSS is Promethean’s Thermal Storage System that can store and release large amounts of thermal energy and can be applied to various cooling applications. Unlike electrical batteries, thermal battery does not need to be replaced every 3 to 5 years. Room Size 640 Cu. Ft. Floor Area Required 150 Sq. Ft.
truck to arrive at 1 pm. From 1 pm to 3 pm the produce travels to a distribution facility located at the nearest town. Transportation is done in an unrefrigerated truck. At the distribution facility the produce is stored in a cold chamber and chilled for the first time. It remains in cold storage until evening time when it is again loaded onto unrefrigerated trucks and sent to Mumbai markets. The lettuce arrives in Mumbai at 3 am the next day and it is sold in the market starting at 7 am. 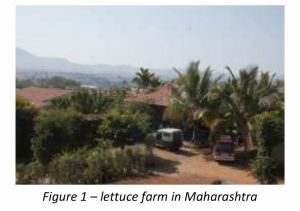 The farm management team estimates that nearly 40% of the lettuce will spoil after harvest. Approximately 20% will be spoiled by the time it reaches the distribution center because of the exposure to heat and as a result of sorting and packaging. The other 20% will spoil during transportation or will be returned from the retail centers as low-quality, unsold inventory. To minimize the spoilage, the fresh produce should be maintained and transported through a temperature-controlled supply chain. A refrigerated truck (reefer) can chill the produce during transport and could reduce spoilage. Reefers are common in most of the world, but in India they are very difficult to operate because of the bad road infrastructure and the high price of diesel. The reefer truck uses an on-board chiller unit which breaks down frequently due to extreme dust, heat and vibration. In addition, the on-board chiller unit runs as an auxiliary engine and consumes diesel fuel thereby making the cost of operation prohibitively high. For this reason, refrigerated trucks are not commonly used in India. The only other option available is to chill the produce at central distribution facilities or cold-storage warehouses far away from the fields where the produce are harvested. However, as shown above, by the time the produce reaches a central chilling facility, a large portion has already spoiled or will spoil in a short period of time after reaching the market. If the produce can be chilled immediately after harvest, it will dramatically reduce the spoilage. Fruits, vegetables and especially leafy greens are very susceptible to field heat after harvest. A chilling system that can be located next to the harvesting fields will pre-chill the harvest and maintain its freshness. Once chilled, the produce can be transported in simple, lightweight insulated trucks to a cold-storage warehouse or distribution facility where it can be further chilled and stored as long as necessary. 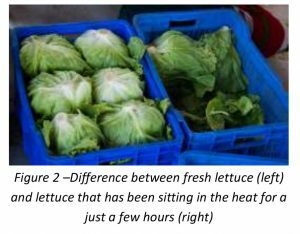 Because the produce is already chilled, the heat gained during transportation is minimal and will not affect the quality. Chilling fresh fruits & vegetables at the source poses other challenges in India. Due to lack of reliable electricity supply in rural areas, the chilling facilities would require a backup diesel generator which makes the operating cost very high. Promethean Power Systems has solved this problem by introducing the use of thermal batteries that can be charged when the grid power is on, and can be used when the grid is off to maintain the cold temperatures. A thermal battery eliminates the need for a diesel generator. 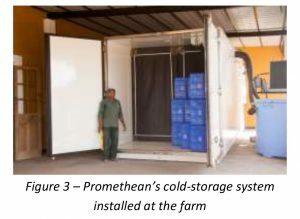 In June 2014, Promethean installed a coold-storage facility with thermal battery backup at the farm described above. The management team estimates that refrigerating immediately after harvest will reduce the overall spoilage from 40% to 20%. Within a single peak season the equipment paid for itself in cost savings from reduced spoilage. In India, cold-chain distribution networks are very difficult to set up, operate and maintain. In these conditions, the practice of “chill then transport” is most economical and best suited to Indian conditions. Chilling the fresh produce immediately at the source will decrease spoilage, increase shelf life of the finished product and increase the profits of the farm.